A very simple quikc vector i did of a scan of motoko. i decided to put only some level of detail in some parts like the face and the crane, then make the rest of the figure just black. I would only suggest a lower saturation. But amazing vector nevertheless. Damn I love it ! Just enough details put in to make it really interesting. also the coloring works for me. ..
What scan was this ? upon first glance the purplish-bg had me wincing..
but upon full view it looks great..
note: as the "King" mentioned keep those GITS coming..
XD I love this scan, & you've done a beautiful job with the vector, per usual. Hm...the colors are a bit grating though. I'm like this one. Based off the episode a week or two ago if I guessing correctly. That was such a good one. Heart touching. Well, think you just gave me some ideas. you did it again oppa. really great vectoring. simple, but i like the depth in shading on hand & crane. lol, stop making good wallpapers. Wow...so simple in presentation, yet so beautiful. I love the purple, black, and blue interplay in this wallpaper. Great choice of colors. Motoko's face is gorgeous, and the blackwash (is that even a word?) of her hair and body both frames the face perfectly and is an interesting effect in and of itself. The inclusion of the paper crane was genious and gives the title of this piece all of its meaning. Another terrific submission, crapmonster, thanks for letting us enjoy your work. whoa..it looks really sharp. especially her face and the crane. maybe just like what u've said...u left everything else black. Quick and simple, yes, but beautiful nonetheless. It looks gorgeous and speaks for itself. Always a fantastic job and yet so artistic. The vector job is flawless, even if it was a quick vector, it still looks amazing *_____*. 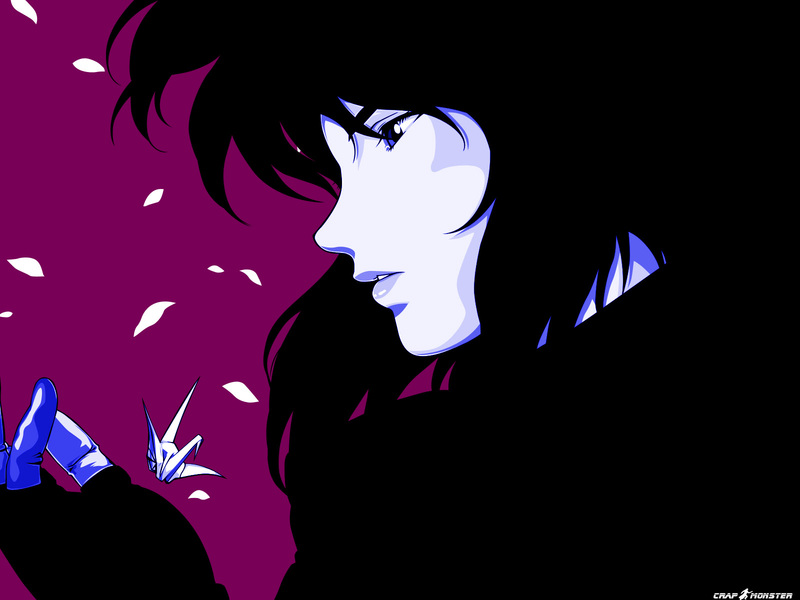 Excellant choice of a picture as well, Motoko always fits the scene just nicely and so very vivid as well. She really is truly beautiful and fits so very nicely with the simplism this background gits at. It still is a gorgeous vector nonetheless and I cannot begin to really put into words how deep I think this is, because I'd end up blabbering on endlessly about it so I'll just leave it short and sweet. I love it, you did a fantastic job capturing such emotion and displaying it so perfectly with just the right amount of color that it really is just perfect for any desktop, a favorite for me. Fantastic work as always, Crapmonster, you are my heeeeeeeeeeeeeerrrrrrrooooo. It's very pretty, but the small shadows on her temple and along the side of her face and her pale white skin make her look a little like a clown. F***** fantastic, excuse my french. Nice! This vector art looks very pretty and creative! The girl looks very mysterious and cold. Great scan and colors! really cool paper. Makes it look stylised. amazing work. love the crane.